Lamar Odom says he and Khloe Kardashian will definitely get back together one day. Lamar Odom is finally saying it on camera -- he still thinks a reunion with Khloe Kardashian is possible ... which seems to explain why their divorce is on hold. Lamar dropped the bombshell in Santa Monica on Monday -- the photog asked if there's a chance they'll get back together, and LO responded, "Of course." There's more ... he goes on to say KK is "still my girl," and the audio is a little low, but we're pretty sure he added ... "That's my wife." He ain't lying. Although Khloe filed divorce docs in December 2013 -- there's been no movement on either of their parts for more than a year. As TMZ first told you ... a judge is threatening to dismiss the divorce filing due to lack of action. Watch ... Lamar's saying exactly what our sources say -- right now, all signs point to NO divorce. 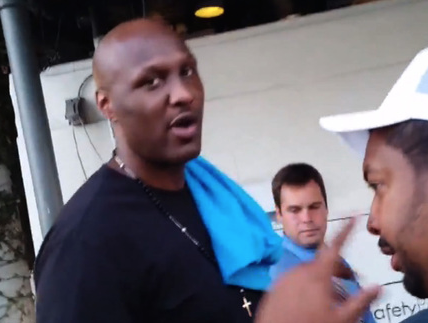 Also interesting -- Lamar's out on the social scene again. He hit up DBA nightclub in Hollywood last night. No evidence though he was dancing the way Khloe did in Vegas.